I believe that this is a remarkably important book, and I wish that the methodology explored in this book received more attention. 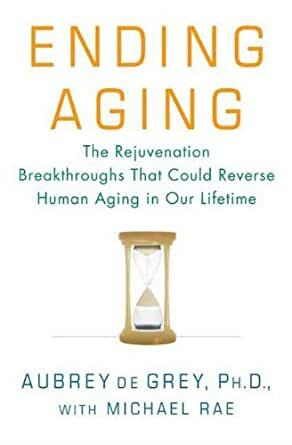 Aubry de Grey makes a clear, well reasoned argument for a complete set of 7 ways our bodies age (at the cellular level) and how aging increases our susceptibility to the diseases we develop in old age. His solution, therefore, is to manipulate the underlying mechanisms of aging at the cellar level, rather than to invest heavily in diseases after they’ve manifested. Aubry de Grey has a particular talent for mixing hard science with Silicon Valley’s techno-optimism, in just the right quantities. His knowledge in the field of biology is unquestionable and his ideas have persisted through many challenges to them. In addition, Aubry de Grey has also made contributions to the fields of AI, and has recently, solved some longstanding mathematical problems. He rarely strays from scientific claims, and only occasionally makes claims about the timelines for his ideas. I believe his analysis on using adult versus embryonic stem cells should be updated to reflect the science of the past decade, but everything else seems to be up to date. 5.0 颗星，最多 5 颗星Accessible book, but not light on the science. I just finished reading Dr. Aubrey de Grey’s Ending Aging: The Rejuvenation Breakthroughs that Could Reverse Human Aging in Our Lifetime (2007), it was an accessible introduction to the biology of aging, and a way that it might be defeated. By default, I am skeptical about anti-aging techniques or claims of some sort of fountain of youth. I’ve heard de Gray’s idea on a podcast, and watched his TED talk. It sounded reasonable, but I wanted to learn more about the science to have a more informed opinion, so I read the book. The plan is referred to as SENS (Strategies for Engineered Negligible Senescence). 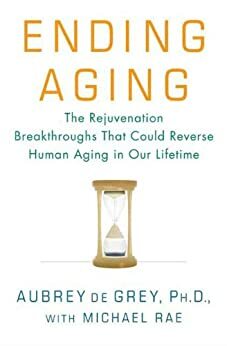 After reading the book, I think it is a plausible plan for an approach to reverse the effects of aging. I’ll summarize the idea and highlight some things from the book that weren’t covered in de Gray’s TED talk or podcast interview. Each of these types of damage is covered in detail in the book, along with one or more possible solutions. For example, number (7) can be treated by using stem cells to replace the lost cells, this has already been demonstrated to work, but there are political hurdles to stem cell research. A comprehensive plan to completely reverse the effects of aging may change this. Another example is (1), he explained how mitochondria, which generate energy in the cells, have their own DNA, and they produce lots of reactive byproducts that damage the mitochondria’s own DNA. This can be fixed by saving a copy of the mitochondria DNA in the cell nucleus, where it is about 100 times less likely to mutate. Some forms of algae already do this, so it is not without precedent. An interesting one is (5), or glycation, which is the process that leads to the gradual stiffening of tissues. Glucose in the blood sometimes sticks to proteins and causes them to tangle up, this is what happens with caramelization, but at a much slower rate. There are already biotechnology companies that are working on drugs that target glycation endproducts, it is possible to undo the glycation damage, further research is needed before all forms of glycation are fixed, but it is simply a matter of money and time. All of the types of damage but (6) seemed relatively straightfoward to solve. It is (6) that is the most troublesome. Assuming all the other types of damage are satisfactorily solved, cancer is still a big problem. In order to keep a human healthy indefinitely, you’d need to prevent cancer growth. There are many types of cancer, and within cancers there are many types of cells, but they all have something in common. They have an active telemorase enzyme, which is what replenishes the telomeres (segments of junk DNA at either end, which shorten with every cell division). Since cancerous cells’ DNA keeps getting it’s telomere’s restored, they can reproduce indefinitely, this is the main threat of cancer, it can grow forever, until it disturbs its surroundings (your healthy tissue). Aubrey de Grey has a solution for this, but it is the most extreme of the book: Remove all telemorase genes from all cells of the human body. This means that the remaining human body only last about 10 years. Since nuclear DNA mutations are inevitable, and sometimes lead to cancers, having all your cells be unable to replenish their telomeres means that all cancers would eventually hit a wall (after about 50 cell divisions). Then, to solve the problem of your cells running out of telomeres, new stem cells could be engineered with a copy of your DNA (minus the gene for telemorase), and you could top off your stem cell supply every 5-10 years. The problem with making all your cells immortal is that cancer will eventually win. By making all your cells mortal, even cancerous ones, you can continue to get SENS therapy until you no longer want to stay alive. If aging is indeed the sum of those 7 types of damage, then this panel of therapies will enable humans to live indefinite youthful lifespans. So it appears possible to keep humans alive as long as they want to live, and prevent the decay and the eventual death of the body. This is fantastic, as the majority of healthcare spending is due to this decay. If SENS (or something like it) can be developed afforably, it would save nations trillions of dollars in healthcare and social security spending, as well as give people the choice to live for centuries. 5.0 颗星，最多 5 颗星Great book! One of the most important scientific ideas of our generation. The problem of aging is the most important problem humanity faces today, hands down. Dr. de Grey illustrates his idea for engineering solutions around the aging problem, and then discusses biology and case studies for most of the remaining parts of the book in support of the idea. More scientists should be goal-oriented in this manner rather than merely reporting on nature. Great book! 5.0 颗星，最多 5 颗星How to Engineer the end of the effects of aging, even before Science fully solves the processes. Aubrey de Grey is a rare combination of head in the stratosphere, feet on the ground unique thinker. The world is filled with people who have grandiose thoughts but a complete unwillingness to do the leg work to check on the research that would make their thoughts scientific method test of, "Does it fit the data." And it is filled with people who cherry pick only the data that fits their theory. The world also has ample share of people who treat data as if there is no bigger picture, that the only valid ideas are those that are right there at ground level. Ending Aging doesn't take either of those 3 well-worn paths. Ending Aging takes in all the data, points out the limitations of it's own theories, builds a framework of thinking in which one can plan out a research strategy that isn't about aging gracefully, isn't about more life in our years, but is really about taking a comprehensive approach to putting aging in the same dustbin of history that we've already placed tetanus, polio, small pox and dozens of other past scourges of humanity. Ending aging is both bold and realistic, both broad brush strokes and deep dive. Ending aging isn't light reading. It's not a plan to follow some past paleo, natural guru whiz-bang notion. It is instead a credible, well thought out plan to attack aging at it's most vulnerable point, the addressable end products of the aging process. "Ant-Aging: has been aproached scientifically before. "Ending Aging" is the first book to apply engineering perspectives and disciplines to the process of aging. Engineering isn't done by mastering every trait, but by bounding problems within a tolerance level where predictability is possible. It is this new concept that makes ending aging a breakthrough watershed book in the field.